Cycling enthusiast Scott Posner is always up for a challenge. So when he learned about The Empire State Ride, he knew he needed to be a part of it. Not only was he up for the adventure, but the mission to end cancer is very near to his heart. When his wife Debby was diagnosed with cancer, the Posner family was expecting the worst. But because of the advancements in cancer research, she was able to receive excellent treatment and is now living cancer-free. Scott believes it’s up to us to support cutting-edge cancer research so that future generations can live in a world without cancer. “If you can make a difference, do it,” Scott said. For the Empire State Ride, Scott, his brother-in-law and cousin have formed the team Tour de Ted. The name is in honor of Ted Jones, Edward Jone’s Investment second managing partner where Scott works. The team is gearing up and training hard for July 29. Besides the great cause, Scott is looking forward to the camaraderie of the riders, the unique stories and the beautiful scenery of New York State. His involvement with the Empire State Ride is also a family affair. 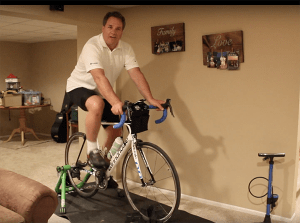 Together with his wife and daughters, the family created a video of Scott in a variety of odd cycling outfits, which you can watch here. He is also using the ride as a teachable moment for his daughters. Through his fundraising efforts, he wants to show the importance of taking on a challenge to benefit the greater good. To learn more about Scott and to support his effort, click here. The Empire State Ride is a one-of-a-kind experience, so if you like adventures, join Scott and the rest of our riders.